Sometimes we cannot or do not want to train in the comfort of a school or training center or whatever name you want to give it. It’s always great to train in bare feet, but it’s just not always possible. Feiyue martial arts shoes are some of the most popular kung fu shoes in the world and are a great tool when bare feet is not an option. Kung Fu shoes are an absolute must if you plan on doing some serious work outdoors, or if your feet just need a break from an unforgiving hardwood floor. Not all of us can train full-time, and I assume a lot of you have jobs like me, so you need to be able to walk without having every step you take hurt. Are Feiyue Martial Arts Shoes Good? Regardless whether you are in the market for expensive kung fu shoes or a cheap version, they of course serve the same purpose. That is to protect your feet. Depending on whether or not you want to buy shoes more often, like every other month, or only purchase a pair once a year, will help you determine your price point. More expensive shoes tend to last longer, so in the long run they may actual cost you less, but it really depends on how and where you use them. 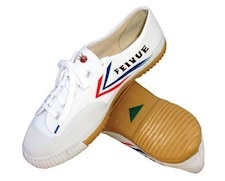 The most famous and common brand of kung fu shoe is made by the Chinese company Feiyue. They have been in business for almost a century, getting started in the 1920’s in Shanghai, China. They are still making quality shoes today that can be seen all over China. Beside kung fu, these shoes have become one of the “go to” choices for the sport of parkour. Feiyue kung fu shoes can run anywhere from about $14.95 and up, so they offer quality without breaking the bank. They aren’t the only option out there though and some people opt for a more western style shoe for their Wing Chun training. 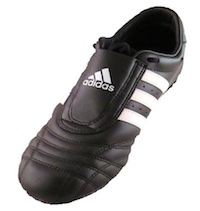 Due to their more rugged build, a lot of people prefer to where Adidas martial arts shoes. They will run you considerably more than a pair of Feiyue Kung Fu shoes , but they tend to outlive the Chinese made shoes also. If you aren’t interested in purchasing a shoe made strictly for martial arts training, a pair of indoor soccer shoes, or even a pair or wrestling shoes, will work too. They both offer proper foot support, and at the end of the day, that’s what really matters. Price vs. Value – are they worth the cost? Are they suitable for indoor or outdoor usage? Something else to consider before choosing the style of shoe is to make sure it’s OK for where you are training. If you are using them inside a school, your sifu may only allow certain brands. If your instructor insists on you wearing only Feiyue or another top brand, don’t worry. They don’t want you to get injured and be unable to participate in classes, so they won’t steer you wrong. Whether you decide on a pair of Feiyue martial arts shoes or another brand of Kung Fu shoes , just make sure they feel good on your feet.